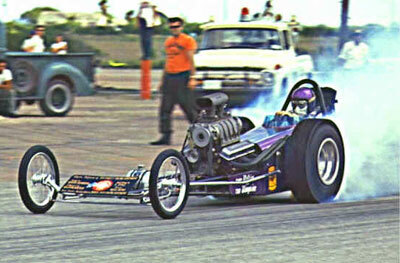 In 1962-65 I built and drove gas and fuel dragsters and I will provide a picture of the car I drove in 1964. 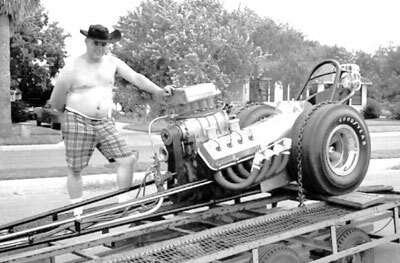 It will be the color picture (below) before the long story about one of the 6-7 cars I built while living in CC,Tx. The back end of the car. The scatter shield was made from a steel, 1/4" min. thk. 14" pipe cap with a flange welded on to fit the engine bolt pattern. Look close at the bottom and note the clutch release fork shaft that sticks through and through; drilling the 3/4"+ holes on either side for a smooth fit of the shaft ain't very easy. You may notice a new scatter shield pipe cap lying in the background. 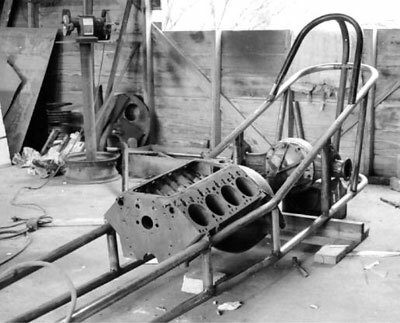 This shot shows the 392" HEMI(R) block. 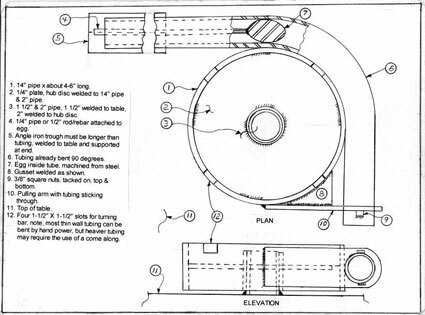 The object between the scatter shield and rear end housing is a homemade lineup jig made from pipe and machined to fit the main bearing saddles, scatter shield bearing housing and rear end pinion bearing housing. The rear end is an Oldsmobile, junk yard variety that was narrowed by torch cutting and welding. A lineup jig was used to keep it close. 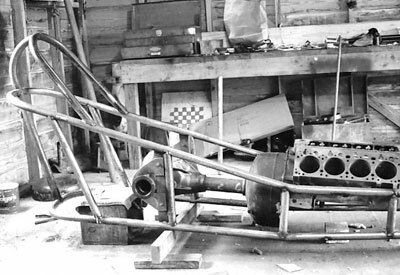 Some axles were shortened by torch cutting and welding; some were resplined and heat treated. This shot is from the engine to the rear. 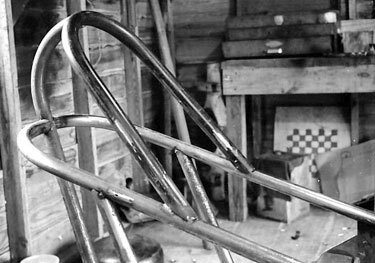 Here it gives an idea of how the frame tube bends look and keep in mind that no two of the frame rails are alike. The uprights were fish mouthed to fit the rails using a hole saw the same size of the tubing; the fits must be good in order to stick weld .050" wall tubing. I would normally put the first pass with a 3/32"Lincoln Fleetweld 180 rod and then cover with a 3/32"Lincoln Fleetweld 37 rod. 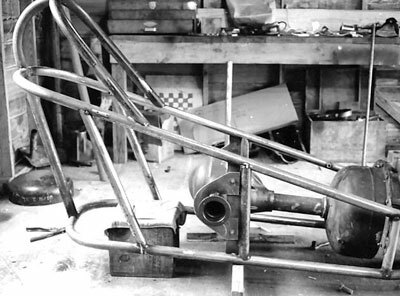 The car frame full length and as I recall it was 180" wheelbase. 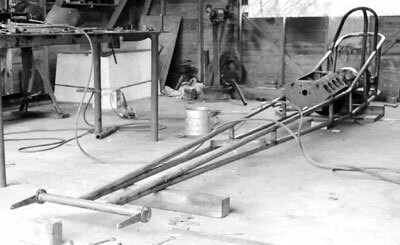 The torsion bar was made from a junkyard VW torsion bar that came laminated by using stacks of 1/8" X 3/8" steel bars, but the normal was to use the correct number to make a 3/4" square bar and then use 3/4" drive sockets welded to the arms bolted to the axle. The trick was to locate and weld the sockets on to get both sides built with the same setting on each arm. 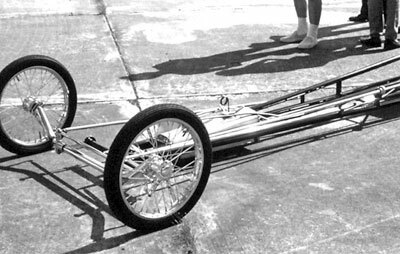 The front end and lots of hours in hand making each component including wheels; hubs machined from solid aluminum 3.5"diameter bar so as to accept tapered roller bearings, spokes were intended for wheel chairs and the hub caps were freeze plugs. The spokes were installed and tightened using a dial indicator so that very little balancing was needed. Negative camber was about 3 degrees and caster about 30 or so. I still have the spoke hole drilling jig. 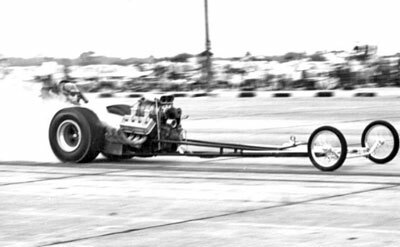 The car on a borrowed trailer for the first time and I think it went to the old Houston track on the Gulf Freeway. As I recall the car ran 3 runs at 215+. The guy with the white hat on and with the big bulls eye is the owner/driver. Any doubts he could get in it. This appears to be a very important conference; the two guys with writing on the T-shirts are the co-owners; guy with the shades is Blackie Blackard (RIP), Blackie. I took the picture, but don't know where, probably Houston. I think the guy with the funny looking hat is Tom Crowley who I built a car for which appears on the near side in the match race 2 photos below. Next is a 2 out of 3 "match" race between Gary Watson, near side and Bill in his first ever and Ford powered race car. These "match" races were like the WWF in that no one ever won the first 2 and back then the money was slim pickins. 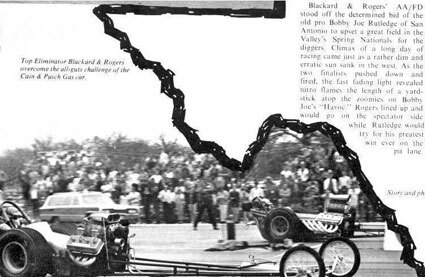 The race was at old Rodd Field at CC, Tx where I and many others saw their first ever big time racers that would come and put on 2-3 exibition runs, the likes of Garlits, Eddie Hill and the twin Pontiacs, Bobby Langley's SCORPION and once with an aluminum channel framed car, Bob Sullivan in Pandemonium and of course half a dozen locals. Next is Bill on a run at Victoria, Tx, I think, and at Victoria Bill hit the ET/MPH lights etc. and laid the right half of the front axle back about 30 degrees, had to cut it off and install a new end. 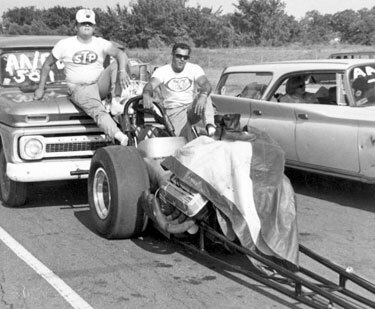 Bill and Blackie waiting in the push to start line; I think at Green Valley near Fort Worth, Tx. 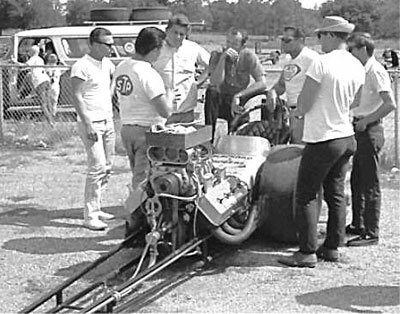 This is probably at the Green Valley Spring Nationals which Bill won over the best diggers in Texas. The race was billed as a $5000 dollar race which was probably more than the cost of Bill's car. There was much torn up equipment at the race with two cars becoming entangled at about 200 mph and the Cortines car flipping 7 times, but he walked away. Last is a little about the Green Valley race and win. 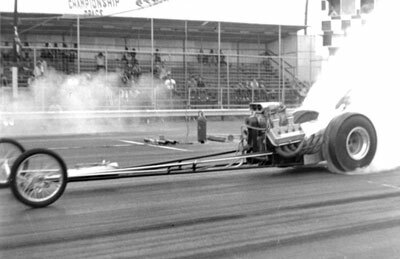 Hope you enjoyed this little dab of drag racing history and one of my biggest regrets is I never spent the time or money to photograph things I have seen since seeing my first ever drag race at Halls, Tn. 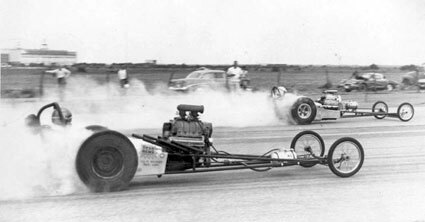 in 1957 or so where I saw what would later become the "Tennessee Boll Weevil" get beat by Lewis Carden's SBC, NHRA record B gas dragster. A friend and I pulled the Boll Weevil trailer back to Memphis to Ray Godman's home where we met him and I first learned of him being in a wheel chair. '51 hemi & '55 sbc; a class of their own. A good dog don't sing on a covered trail. As in Cool Hand Luke, "What we've got heah is a fail-ya to communicate." "Shakin' it over here, boss". Site Copyright Ewald Enterprises, 1998-2017. All Rights Reserved.